You’ve mentioned that the first thing you remember was being electrocuted when you were two years old. Did that incident have an impact on your eventual art? The electricity socket was not working and my family called an electrician to fix it. He opened the socket and I put my finger in it. I'm not sure if my memory is playing tricks on me, but I have a feeling that my parents told me not to do it, and that sparked my curiosity. This event confirmed the fact that I’m interested in all things prohibited. Where does your inspiration come from when enhancing your portraits? Do the subjects themselves inspire the enhancements? 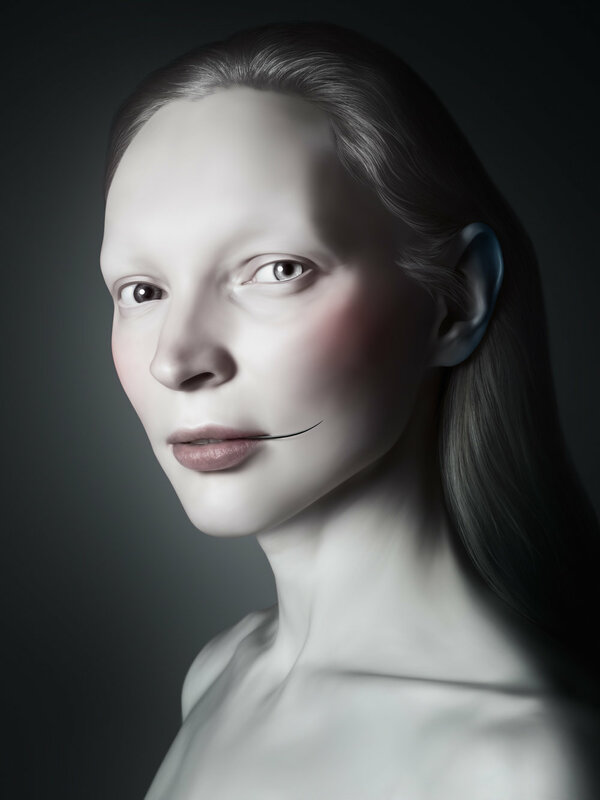 It started off as a parody of the extensive retouching in fashion magazines and evolved into a character study of human beings. My passion for art and society, and classical and contemporary art, was also a big factor in fine-tuning my current aesthetic. Usually the models themselves don’t inspire my creations, although there’ve been a couple of exceptions. It all depends. Your creatures are strikingly innocent and dark, animalistic and angelic. How come? We are all originally animals, but humans are social animals, and have to share the world and their inner world with others. In an ideal world, they should both match, but in reality they don’t, which translates into inner conflict. My fawn or werewolf creatures are a depiction of said inner-conflict, would it to be seen by the outside world. Some say eyebrows are the most expressive features on a human face. You seem to blend in the eyebrows of all your subjects, rendering them slightly off-putting. How come? I’m very inspired by the renaissance era, which is why I tend to remove the eyebrows, but I don’t always remove them. The eyes of your subjects are particularly striking. All of your subjects have a very challenging gaze, as though they are daring you to see them for who they really are. It is all about eye contact. When doing portraiture, eye contact is a core device. It allows for our silent inner observer and unusual inner being to come through. There’s an emanating tension that stems from the paradoxes depicted in your work. Do you believe in good versus evil, or are we all a little bit of both? I don’t believe in the proverbial inner struggle between our good and evil sides. Humans are complicated and complex. We all have coexisting good and bad sides. It’s just a matter of how we choose to balance it all out. Balance is a must. All of your subjects look like they have an intricate and fantastical backstory, as though mythical characters. Have you ever considered fleshing their characters out or would you rather leave it up to interpretation? I usually leave it all up to interpretation, but sometimes there is a specific story behind my work. For example, for my last show I developed a character called ‘Narcissus’. He was always busy looking at his own reflection and never noticed other people’s love for him. He then got bit by a Vampire and transformed into one, leaving him devoid of his own reflection for the rest of his life. Have you ever thought of venturing into character design for the film industry? I would love to so something for the film industry one day. It’s definitely something I’m interested in. What’s next for Oleg Dou? I'm working on my next show. It should be ready by next year. I will do photos as usual, but there will also be some object designs and a short video. I like to develop my work and explore new formats as much as I can.